As a country, we are paying an extra £7.2 billion to the Big Six energy suppliers every year! Just how much money do we overspend on our energy? You may be shocked to know that as a nation of hardworking households we overpay a staggering £7.2 billion to energy companies for our energy supply every year. That’s… a lot! At Migrate, we’re dedicated to tackling this issue head-on and helping ordinary people save their hard-earned money by reducing their energy costs. It’s for that reason that we wanted to give a clear picture of just how much you, me, and the rest of the UK, are being ripped-off on their energy bills every year. And, importantly, just how much we could save by switching to a cheaper energy supplier. What do we mean by overpaying for energy? Thousands upon thousands of households in every region of the UK are overpaying for their energy every year by not benefiting from the savings to be made by switching to cheaper energy suppliers. Often, when a household doesn’t switch who their energy supplier is, that supplier will increase the cost of their energy by moving them onto a more expensive ‘Standard Variable’ tariff. Yes, energy suppliers penalise your customer loyalty! We’ve calculated just how much money households in each UK county could save by switching to the cheapest energy tariffs available, and at the same time calculated just how much is currently being unnecessarily overspent by all of us who aren’t switching to cheaper deals. Given that energy costs vary by region, we can also establish which regions in the UK typically pay the most for their energy, and which regions stand to save the most by switching to a cheaper energy deal. How much is my county overpaying by? Perhaps unsurprisingly, the people of London collectively pay the most for their energy. With its millions of residents, London collectively feeds the big energy companies an extra 1.3 billion a year. Outside of London, the county which overpays by the most is the West Midlands. 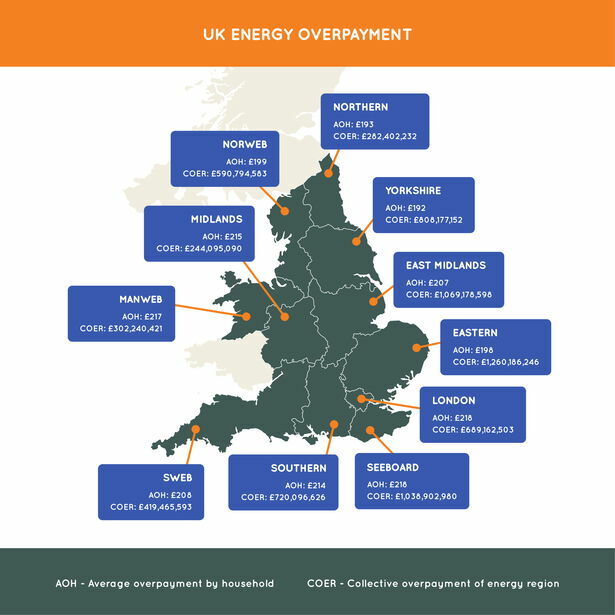 The West Midlands collectively overpays £200 million for their energy, closely followed by the West Yorkshire, which overpays by £177 million. Ultimately, however, the regions containing the greatest number of households have the highest collective overpayments of course. But which households specifically pay the most for their energy? And where are they? Despite the efforts of the regulator with the energy ‘price cap’ which came into effect on January 1st 2019, it’s important to understand that this won’t automatically prevent you from being ripped off by energy suppliers. What’s more, energy prices continue to vary between different parts of the country with households in the South West paying £62 more than households in Yorkshire for the same energy. Amazingly, households in these counties typically overpay by £215+ every year compared to the amount they would pay if they switched to a cheaper energy supplier. The county with the cheapest energy in the UK is West Yorkshire. Even so, typically a household in West Yorkshire is still overpaying by £190+ each year. Ultimately, we’re all still paying more than we should! And the energy companies are having a field day with all the extra cash we’re giving them. Average household energy costs were calculated using Ofgem average consumptions values of 12,000 kWh gas and 3,100 kWh electricity, paid by monthly direct debit. Current energy costs were calculated using the standard tariffs from the most common Big 6 supplier in each region (British Gas, EDF, E.on, Npower, SSE and Scottish Power), and were compared to the cheapest tariff available to switch to as of January 10th 2019. How do I pay less for my energy? In order to spend less on your energy each year, you could just cut down on your energy usage, and you might be thinking about getting a smart meter installed, so you can monitor your usage more closely – take it from us, this is not the best way to get cheaper energy bills. Ultimately, the best way to get cheaper energy bills is to switch your energy supplier regularly, about once a year, so you never risk getting put onto the expensive tariffs we discussed above. To do this, you’ll need to switch energy supplier every year. You might be thinking, ‘Ah… that’s a lot of hassle.’ And sure, up until recently that would have involved going onto various price comparison websites and trying to find the best energy deals. Here at Migrate HQ, we’ve come up with a better solution: automatic switching! Automatic switching takes the legwork out of getting cheaper energy because we do it all for you. When you sign-up with Migrate, you’ll tell us a bit about your energy supply, and whether you have certain preferences – like whether you prefer green energy deals, for example – and then we’ll do the rest, we’ll automatically switch you to the cheapest energy deals available every single year. And we do it all for free, too! If you want to read more about automatic energy switching and find out how we can help you avoid these major overpayments, check out our blog where you can find the facts so you have all you need to know. Migrate to cheaper energy today! Take the hassle out of energy switching. Let us migrate for you, for free! Switch energy supplier with ease every year for free.